For quotes from the TV Series, see Flight of the Conchords (TV Series). 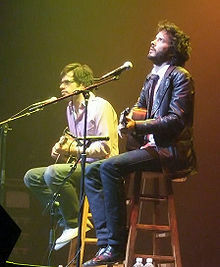 The Flight of the Conchords is a New Zealand folk/pop/comedy duo composed of Bret McKenzie and Jemaine Clement. Jemaine: That's just one of the things. Bret: Yeah. Like, the future of the planet. Bret: My children's children's children, you know. Jemaine: It's just going to get into this ridiculous Russian doll situation. Jemaine: Have you met my kid? Have you met their little kids? And then, it's just going to be--Hmm. Well in some ways, I think your children aren't going to be affected by a lot of things that affect other children. Because your children... aren't real. Jemaine: Do you see the distinction? Bret: Yeah, yeah, sure. But they still have issues, that don't get taken seriously. And they have to deal with all the imaginary stuff, like rogue unicorns, for example. You know. Jemaine: Okay, so--there's lots of things that I haven't thought about, I guess. So, sorry. Bret: Yeah. My wife and I weren't able to have children, so we chose to imagine them. The doctor suggested it. And it's actually been incredibly rewarding, you know. Jemaine: Bret's wife is unable to have children because she's not a real woman. Bret: No she's--yeah, she's imaginary, yeah. The kids take after her in that sense, but she is--she's very beautiful. She is a very beautiful woman. Jemaine: She's a very beautiful woman. Much--she's a much better kind of woman than some of the women that I've imagined. Jemaine: But this song is more about the real world issues. That are affecting us--everyone--today. Bret: It's called, Think About It - Think, Think About It. Bret: There was a bit in that song where we were dealing with the issue of AIDS. The bit with the monkeys. Jemaine: Yeah because it was believed that AIDS was contracted from the monkeys. Not the band but the animal. And we just wanted to deal with that issue--just a couple of points. Just changing the attitude towards AIDS from being "Eww AIDSy" to more like "Ohh! Fun monkey disease." Bret: This is the DG20. Jemaine: We got this from a pawn shop in the future. Interview with Mike McDaniel of the Houston Chronicle, HBO's Conchords takes flight. Houston Chronicle (2007-07-13). Retrieved on 2007-07-21. Interviewer: So what's the coolest thing about living in America? McKenzie: Paying taxes to George Bush is a real treat. Clement: What Bret means to say is the people are friendly. Clement: We're Flight of the Conchords, from New Zealand. McKenzie: I dunno if you guys know much about New Zealand, but, uh, a few years ago we invented something we call hip-hop. McKenzie: Do you remember when we invented hip-hop that day, with Steve? Clement: At the barbecue?.. these guys are the funniest people? This page was last edited on 10 November 2016, at 15:30.